Whiteabbey Primary School pupils Evie Wright (7), Luke Campbell (8), Sol Proctor (9), Frank Davis (9) and Lauren Donald (8) celebrate 100 days to Rio 2016 at Ulster University's Olympic-themed celebration that provided the pupils with the opportunity to try out new sports ranging from volleyball and golf to long jump and gymnastics. Ulster University has marked 100 days to Rio with the announcement of £100,000 of sports scholarships that will help high performing student athletes excel in both their studies and sporting ambitions. The Performance Sport Scholarship Awards will provide funding to support one year of Ulster University tuition fees for students who represent the University in a range of sports at senior intervarsity level. Along with the financial support, students will be given access to an individually tailored programme of support services from University experts including performance planning, screening, physiotherapy, strength and conditioning, sports nutrition and sports psychology. The athletes will also benefit from flexible learning opportunities to enable them to pursue their sporting careers at the highest level while successfully completing their university degree. 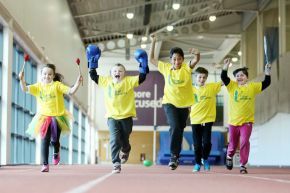 Ulster University announced the scholarships at an Olympic-themed celebration that gave local school children the opportunity to try out new sports in everything from volleyball and golf to long jump and gymnastics. As part of the event, Ulster University student volunteers delivered games to over 180 school children to encourage them to lead physically active and healthy lifestyles. Adding to the festivities, the primary school pupils got the chance to create new music with a carnival drumming band and hear from university student athletes about their positive experiences of competitive sport. Ulster University's Head of Sport Services, Nigel Dobson, said: "Ulster University is a leading university for sport across our teaching and learning, research, competitive participation and community outreach. Today's event is about using the Olympics' spirit to raise awareness about the benefits of physical activity and enhance participation in sport at every level. "As the University opens its doors to local school children to engage in new sports, we are also delighted to announce £100,000 of scholarship funding for university student athletes. These sports scholarships will provide a comprehensive support package allowing Ulster University students to reach their full potential in their sporting arena and academic studies."